Why can’t I register for an account on your site? Yes, you do. It’s free and it only takes a moment. In addition to being able to track and review orders, registered members receive discounts, special offers, and are eligible for drawings for free patterns and other prizes. We have a step-by-step tutorial with images for setting up an account on our site. Follow those steps. Can I order products by phone or mail? Not at this time. 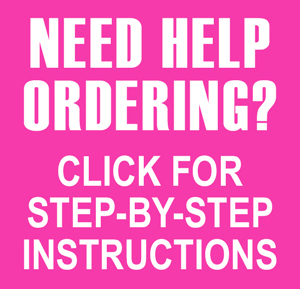 You may only order products from our website or visit us at a local event expo. No, but you must have a valid credit card for use in the U.S. We use PayPal to process all payments, but you don’t need a PayPal account to use it. Not at this time. Sorry. You must pay for your order with a valid credit card or PayPal account. Yes! You can order them here. When you enter the information and click the Continue button, it adds the gift certificate to your shopping cart. Check out as usual. Upon completion of payment, the recipient of your gift certificate will receive an email from us with instructions for redeeming it. If I’m local, can I pick up my order instead of having it shipped? Follow the process outlined on our Shipping and Returns page. How do I purchase a DIGITAL PATTERN from your site? Visit our Download Information page (see “Purchasing a Downloadable Pattern” section) for step-by-step instructions. Can I mix physical products and digital products in the same order? Yes, you can. Just put them in the shopping cart and check out as usual. You’ll be able to download your digital products as soon as your order is complete. Physical products will be shipped according to the terms on our Shipping and Returns page. Can I purchase more than one copy of a DIGITAL PATTERN? Yes, you can, but if you’re purchasing multiple copies as gifts, we recommend purchasing a Gift Certificate instead. This allows the recipient to visit and register at our website and to have continued access to the file if they need to download it again at some future time. It also allows us to provide support if there are problems with their file. How do I download a DIGITAL PATTERN from your site? Visit our Download Information page (see “Downloading Your Pattern” section) for step-by-step instructions. If your original download file becomes corrupted or lost, we allow you to download the file up to three times. Just log in and go to your Downloads page. If you use up your allotted downloads, please contact us for support. A zipped file is a file with a .zip extention. Zipping a file compresses it to a smaller size for faster download. Most of our files are straight pdfs and do not need to be unzipped. But if you do download a zipped file, visit our Download Information page (see “Unzipping Your Files” section) for step-by-step instructions. A PDF file is a portable document file that can be opened and read on a PC, on a Mac, and on many other devices and platforms. You will need Adobe Reader or another PDF reading software. You can download Adobe Reader free at get.adobe.com/reader/. Visit our Download Information page (see “Printing Your Pattern” section) for step-by-step instructions or follow the instructions that came with your PDF reader software. Visit our Download Information page (see “Printing Your Pattern” section) for step-by-step instructions. What if I lose my DIGITAL PATTERN file? Another benefit of registering! Simply log into your Account and download it again. If your original download file becomes corrupted or lost, we allow you to download the file up to three times. If you use up your allotted downloads, please contact us for support. What if I accidentally purchase the wrong DIGITAL PATTERN? Don’t download it! If the digital file hasn’t been downloaded, we can refund your money or offer an exchange. However, once a digital file has been downloaded, it cannot be returned for refund. In some cases, an exchange may be offered. See our Shipping and Returns page for details. Can I return a DIGITAL PATTERN if I don’t like it? A downloaded digital product may not be returned for refund. If you are dissatisfied with your digital product for reasons other than defect, we will offer a replacement product of equal or lesser value. We reserve the right to refuse replacement products to customers who abuse this privilege. See our Shipping and Returns page for details. I have a pattern I’d like to sell on your site. Are you interested? No, sorry. We are not a publishing or distribution company. We carry only those patterns and products designed in-house for Doll Stuff by Jana. Is this the same Jana Lee Beus who designs patterns for Simplicity? Yes, it is! Although most of the patterns for Simplicity don’t carry the Sunrise Designs logo or the Jana Lee Beus name, you can still find some of her patterns there. Is this the same Jana that created the Sunrise Designs patterns for children’s clothing and home decor? Yes, it is! Most of those patterns are out of print now but we’re working on getting them online as downloadable patterns. If you subscribe to our newsletter, you’ll be notified when they are available. Will you ever have patterns to fit dolls of other sizes? Like the 11″ fashion dolls? Yes! They are currently in the design and development phase. We are working on them as fast as we can. Please be patient. I love your products! When will you have something new? We have over 100 new products in the pipeline and more that are still in the idea stage! We estimate that we will release 2 to 4 new patterns a month. We are working on them as fast as we can. Please be patient. If you want to be sure you are notified when we have a new release, subscribe to our newsletter.